Join the discussion on our forums! Come discuss Banana Buffoon over in our dedicated Banana Buffoon discussion topic. Awesome in priest. With Radiant Elemental the bananas cost (0), which can be used to great effect with Lyra, and they can even be used somewhat inefficiently to tech 4-Attack minions so that they can be hit by Shadow Word: Death. Helps with Open the Waygate and The Last Kaleidosaur, if nothing else. I think this is the sleeper of the set. There are soooo many decks that can abuse this. Wild tempo mage loves this, Gadgetzhan Auctioneer rogue decks love this. The 4 mana 3 3 mage bird summons 2 2 drops with this, quest mage gets 2 easy procs with this, priest can immediately use the 2 bananas with Radiant Elemental and Lyra loves this, as well as the spellstone loving this. Paladin can trigger 2 procs on the quest with this, and there's probably a ton of more options that I can't currently think about. I once had my doubts about dusting Mukla, Tyrant of the Vale, but apparently I got 10x dust value. 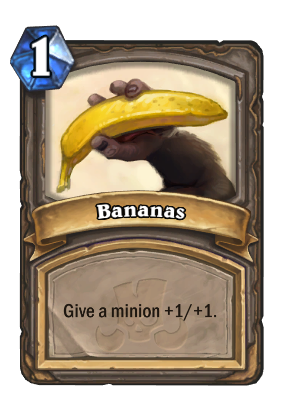 New legendary spell incoming--once Skulking Geist rotates ofc--"If you have ten bananas in your hand, win the game." This card is extremely powerful in Wild. Removes the headache of running sub-optimal fluff in decks like OTK Paladin & Quest Mage. 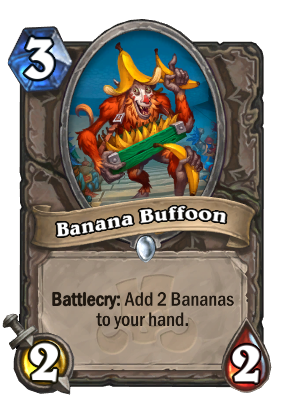 Really nice in some kind of Aggro Priest - turn 2 Radiant Elemental, turn 3 Banana Buffoon for sweet tempo gains. Most unexpected Quest Mage card of the set, for sure. This card is great and real recommended for arena. Wonder if it will be underestimated? Mukla, Tyrant of the Vale, but smaller. Might see use in quest mage...? quest paladin, in wild dk paladin via refresh hero power with spell minion .